Dwayne Wharton, M.Ed is a Senior Consultant at CURE. A Philadelphia native and former U.S. Peace Corps volunteer, Dwayne has served as the Director of External Affairs at The Food Trust for several years where he leads local, state and national advocacy and health equity efforts. 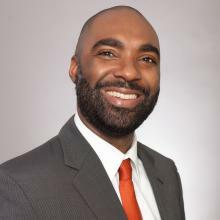 He is an appointed member and Vice-Chair of the City of Philadelphia’s Mayor’s Commission on African-American Males and Chairs the Philadelphia Food Policy Advisory Council Food and Health Committee. Dwayne serves on the boards of the Kynett Foundation, Greater Philadelphia Philanthropic Network where he chairs the Diversity, Equity & Inclusion Committee, and the Bridging the Gaps Community Health Internship Program. Dwayne completed Bryn Mawr College’s Nonprofit Executive Leadership Institute program and earned a Master’s Degree in Educational Administration from Temple University. Dwayne is also a Robert Wood Johnson Foundation Culture of Health Leader.